ARRRGH Me Hearties! 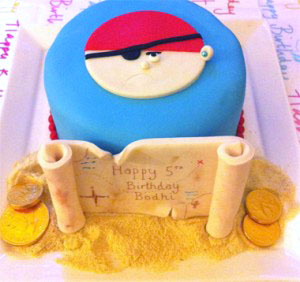 We’ve rounded up a few ideas from around the Australia and from yonder shores to inspire you when planning your Pirate themed birthday party. 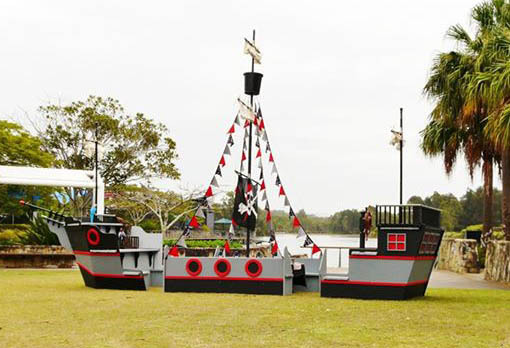 No pirate party is complete without a Pirate ship. This incredible timber ship was created by the party stylists at Mums Little Party Secret. 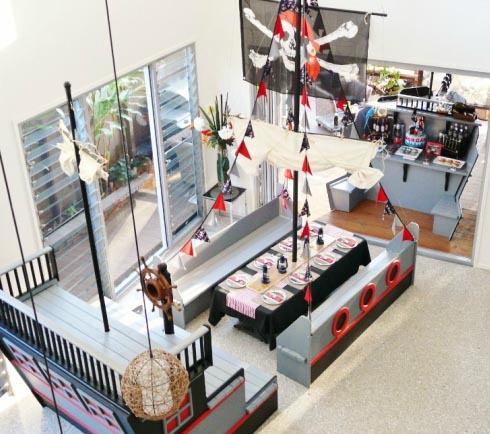 It is cleverly crafted and once assembled it provides table seating for guests, buffet area for cake and other goodies and a play section where kids can take the wheel and search for buried treasure. 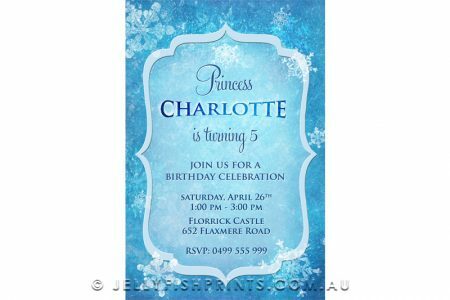 The best thing is that if you are living in the Brisbane area you have the option to hire this ship for your own birthday celebration. Soooo jealous as we’re down in Sydney. 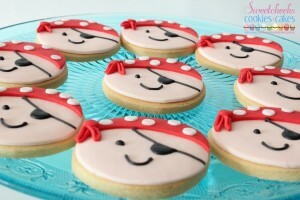 Yummy Pirate cookies from Sweetcheeks Cookies & Cakes. These pirate faces are made of Sweetcheeks’ signature sugar cookie recipe and can be customised to your liking (different faces/colours etc) and they are shipped Australia wide! 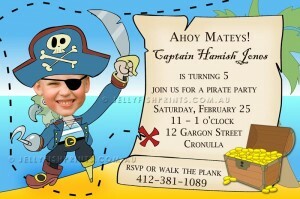 Our own Pirate party invitations in the shoppe are pretty sweet. You can pop the head of your own child onto the body of a swashbuckling pirate marooned on an island with his treasure. 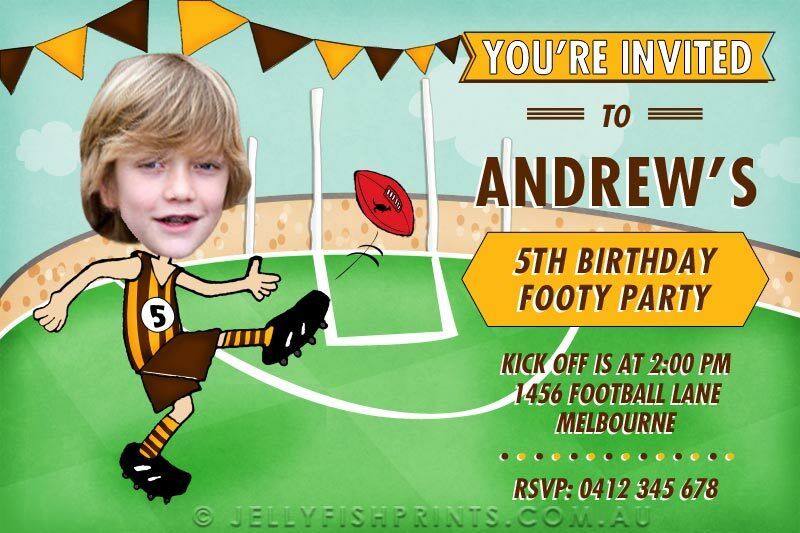 Get our printable pirate invites here. 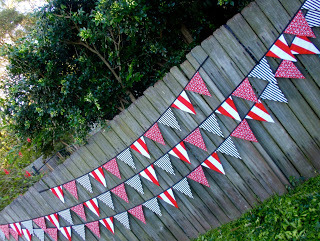 Hand made pirate pennant banner decoration to string up around your party area from Giggle Berry Creations. 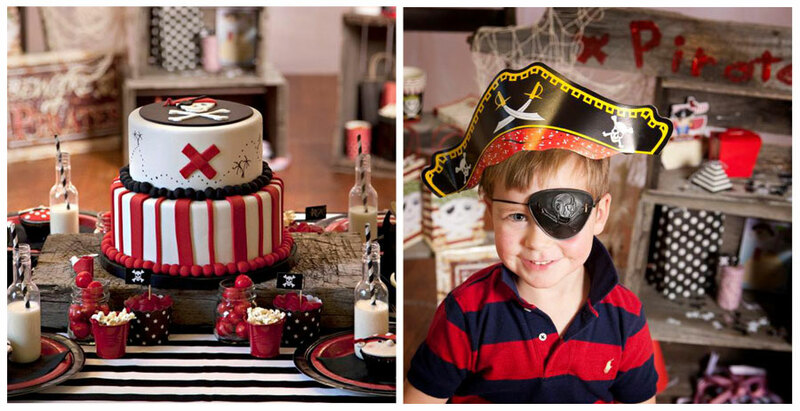 All kinds of Pirate Party supplies from The Party Cupboard including cups, cupcake wrappers and toppers, balloons and other decorations, jolly rodger flags and loot bag gold coins. There’s quite a good range at the The Party Cupboard. Grace shares her tutorial to make your own eye patches with felt and elastic. 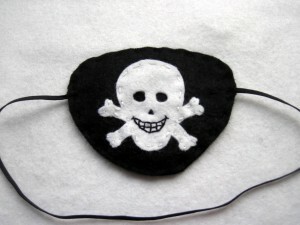 This fun and easy Pirate Eye Patch tutorial will show you how to create a little soft eye patch for your mini pirate, which will be proudly paraded round with a resounding “Aaaah-Haaaaar”! These eye patches would make a great DIY party favor or party activity. There is a template and full instructions to make your own. how to make pirate themed pie pops with recipe. 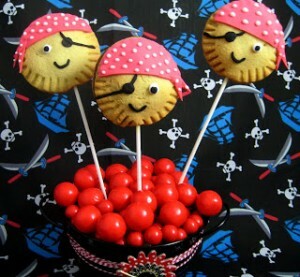 Pirate Party Pie Pops, say that five times real fast without stopping… Another treat to add to my to do list, pie pops. I love pie and this recipe by bubble and sweet will certainly satisfy my love for pie. 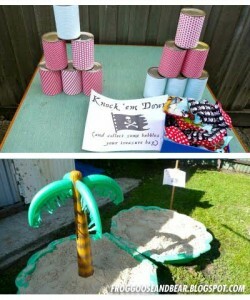 Knock em down and dig for treasure games. 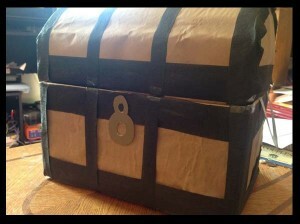 Here’s a party post with a bunch of different pirate party games. The best thing about them is that you can scrounge up most of the materials to prepare the games from around your own home. You might have to pull out your markers and dip into your well of creativity to draw up a game or two but they are very simplistic drawings that should be easy enough to manage. Pirate Games include: Treasure Toss, Digging for gold, Knock ’em down, Walk the plank and pin the eye patch on the pirate. 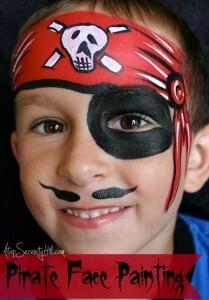 Pirate face painting tutorial . 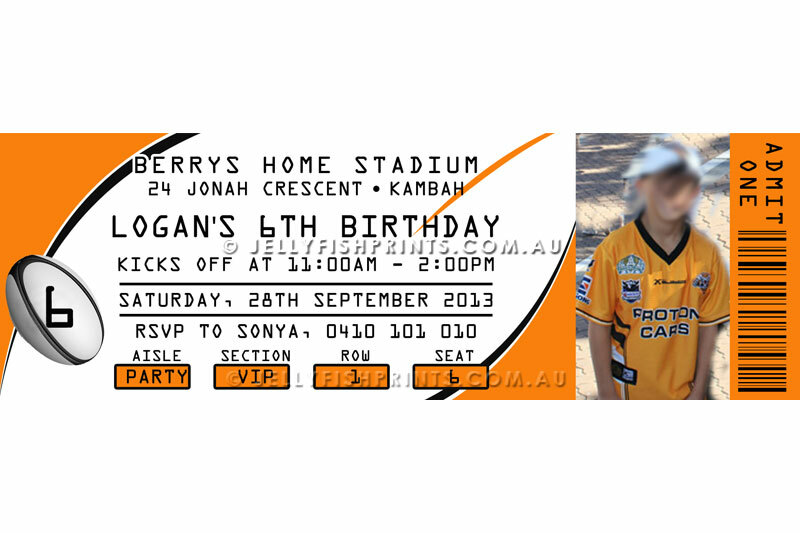 I love the face painting tutes on this site, super simple to follow and you will be amazed how awesome you are at face painting. who knew? And last but not least some fun homemade pirate costumes by Dana. 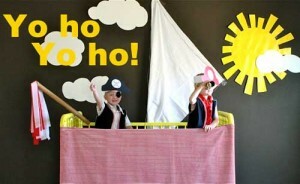 Fab for a a pirate themed party or just for a bit of dressup and playtime action at home. Hope this helps you on your way to pirate bliss. 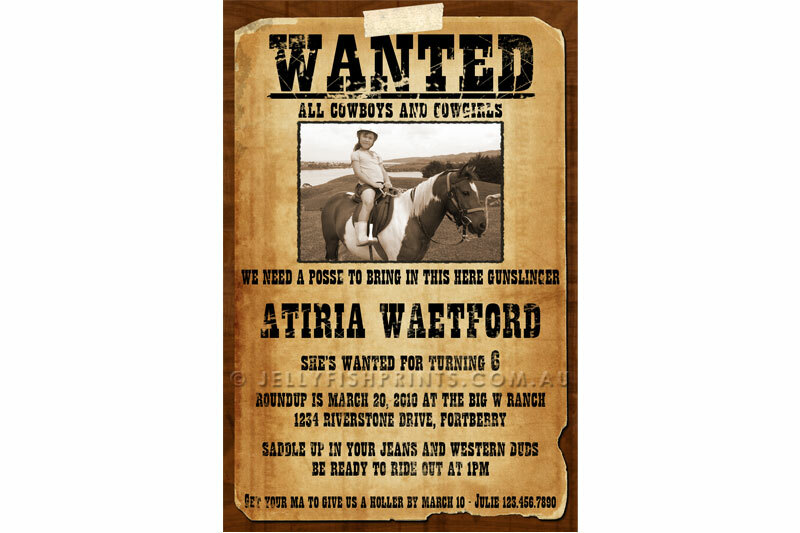 There are a bunch of ideas out there and I’m sure you’ll find the right fit for you. Just make sure you have fun, because it ain’t no party if there ain’t any fun.